A woman allegedly physically assaulted her parents and threatened her dad with a knife after they refused to take her to Outback Steakhouse, according to reports. A woman in Palm Beach County was arrested after allegedly assaulting her parents when they refused to take her to an Outback restaurant. Deana Seltzer, 28, was charged with domestic battery, battery on a person 65 years of age or older and aggravated battery with a deadly weapon. The victim’s mother told police that Seltzer asked to go to Outback. When the mother said no, that’s when Seltzer became enraged and began punching her chest and arms. Police said Seltzer’s father tried to break up the fight, and she began assaulting him. He received scratches to his face and upper body. Officials said Seltzer then began running around the home and flipped over a large glass table, recliners and other pieces of furniture. 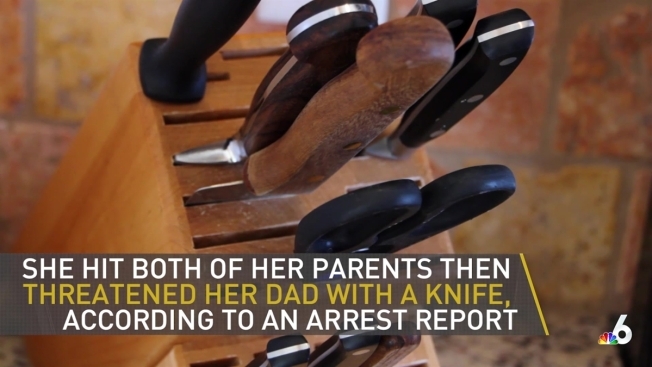 She then ripped a 12-inch decorative knife off a wall and ran toward her father while screaming, “I’m going to [EXPLETIVE] kill you,” officials said. He was able to grab her arm and wrestle the knife from her. Police arrived on scene and set up a perimeter around the home. Seltzer eventually ran out of the home and was taken into custody.